Easy Vasectomy Reversal® procedure with no-scalpel and no-needle techniques takes about 2 hours. It is performed under local anesthesia similar to the anesthesia used for vasectomy but with a longer-acting drug. 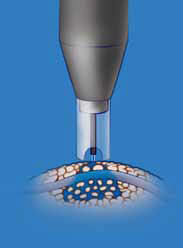 Continuity of both vas tubes can be restored through a single small incision. Magnification is accomplished with either a surgical microscope and optical loupes, the high-power glasses used by gem-cutters and by cardiac surgeons when bypassing the small coronary blood vessels. No-scalpel vasectomy instruments were developed by Dr. Shungiang Li, in China in the mid-70’s and introduced into the United States in 1989. Many years ago, Dr. Steven Shu innovatively improved his surgical techniques on vasectomy reversal procedure by using the same principles and no-scalpel instruments. A vasectomy reversal (vasovasostomy) is a microsurgical procedure that reconnects the vas deferens where it was interrupted by a vasectomy. A traditional approach to vasectomy reversal is to make two incisions in each side of scrotum. Over the past decade, more surgeons adopted a single incision in the middle of the scrotum. In order to further reduce the trauma, the recovery time, the operative time, and the postoperative complications, the mini incision vasectomy reversal approach was proposed. Similar to no-scalpel vasectomy, the initial mini-incision is created using a sharp penetrating forceps that spreads the tissue apart instead of cutting it with a sharp scalpel. Conventional anesthesia in vasectomy reversal surgery involves general anesthesia, intravenous sedation and needle injection for the local anesthesia. Dr. Shu uses the modern no-scalpel technique, exposing each vas in turn through a small opening in the front scrotal wall under local anesthesia. Since the opening is so small, it is easy to apply anesthesia without the use of needles. 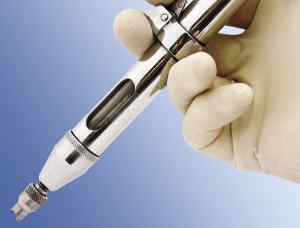 A spray applicator (MadaJet®) delivers a stream of anesthetic so fine that it penetrates the skin and diffuses to a depth of about 3/16 of an inch, enough to surround and anesthetize each vas tube in turn as it is lifted into position beneath the skin. Supplemental anesthetic can be given intraoperatively as needed, at that time, the patients won’t feel any pain since the vas and surrounding tissue is pre-anesthetized, and the needle doesn’t need to penetrate the skin any more. With the patient lying down, the scrotum skin is cleaned with alcohol and a small amount of local anesthesia is placed into the scrotal skin with a needleless pressure spray applicator. Then the scrotum and its surrounding areas are prepped with Betadine. Dr. Shu begins the procedure on the right side by gently bringing the vas deferens to a position just under the scrotal skin. The small opening in the numbed area of scrotal skin is made with a pointy hemostat: one tip makes a pinpoint opening, then the two tips are used to spread and enlarge the opening to about less than 0.5cm. Since blood vessels in the skin are spread apart rather than cut, bleeding is less than when a scalpel is used. The vas deferens are then secured and pulled out with a ring clamp through the small opening. The surrounding fascia is stripped with a sharp instrument to expose the vas deferens. In the meantime, supplemental anesthetic is given intraoperatively as needed. The scarred ends of the vas were first removed at the point of blockage created by the vasectomy, and upper ends are irrigated with saline to check the patency. A fluid sample will then be extracted from the end closest to the testicle to see if the fluid contains sperm. If the vas structure is workable, then the ends of the vas are connected to reestablish the passageway for sperm (vasovasostomy). The vas ends is bridged and aligned with a needle. Anastomosis of the two ends was accomplished with #9 nylon sutures in the modified single-layer fashion. 8-12 sutures total were used. The tiny wound was closed in the subQ with absorbable suture or not closed. No drainage is placed.